The Santa Fe, NM based singer Will Courtney's newest solo record Crazy Love is a mix of twangy rock and Texas dusty rolling. The former Brothers and Sisters front man sings about heartbreak and getting wasted over steel guitars and easy back beat. "Too High Now" begins the album on a more Southern California rock note with shades of Crazy Horse guitar leading the hard rock way. It is a contemplative track before the more southern traits rear their heads as whiskey and women, divorce, literal and figurative car crashes come into the picture supported by lap steel guitars, twangy twists and light drums. Tunes like "Loaded" and the title track all travel familiar paths while "Drunk on Your Songs Again" is the mandated cowboy ballad which does better then the more dull "When Will I Find My Love". The cliche and simple lyrics are everywhere but solid production and Courtney's voice help smooth those bumpy tired phrases over, but tracks like these have been heard before. "Look at All the Things" and "" are clunkers but Courtney though is not trying to present something new, he is singing songs about heartbreak with Alt-Country, indie and pop rock tendencies. "Take You Away" has a loose rambling strut to it while "Partner In Time" is an acoustic strumming sunset Wilco influenced winner and "Finally" is pop rock where Courtney strains to hit the notes and retreats back into some fairly standard phrases. "Coming On Strong" is the real outlier here as the tune throws a complete curve-ball, injecting 80's AOR synths and twinkles in the vein of The War On Drugs; a cool tune that seems a touch out of place on this album. 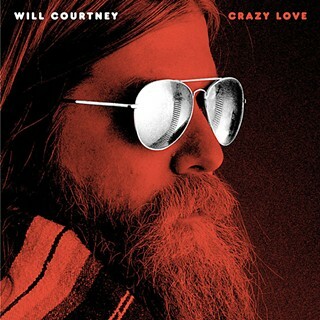 Not reinventing the wheel just a collection of decent if nondescript tunes, Crazy Love finds Courtney continuing his stroll through the rock and roll backwoods of the south western United States.